Winner of 19 major accolades, including multiple Tony, Olivier and Drama Desk Awards, Stephen Daldry's production of J.B. Priestley's An Inspector Calls continues to astound audiences more than 25 years later with its eerie prescience. Staged by Daldry (Billy Elliot, The Crown) in 1992 at the National Theatre, this reinterpretation of Priestley's expressionistic thriller has been hailed as one of "the defining productions" of modern British theatre, "a work of great directorial daring, breathtaking visual invention and passionate moral urgency" by London's Daily Telegraph. A festive evening at the home of the Birlings, a well-heeled British family, is suddenly interrupted by a mysterious visitor: a grim inspector investigating the death of a young woman. As the inspector continues to ask one penetrating question after the next, this close-knit family begins to unravel -- and long-buried secrets surrounding the girl's death are slowly unearthed. Existing simultaneously in 1912, post-war society and modern day, Daldry's spectacular production is both a plea for a more just society and a warning of what's to come if we fail to attain it. Don't miss this edge-of-your-seat thriller, courtesy of the Shakespeare Theatre Company, at Sidney Harman Hall in Washington, D.C.
"...“Class” dismissed! Or rather, deliciously dissed, in the elegant wrecking ball J.B. Priestley takes to English class presumption in his 1945 play, “An Inspector Calls.” Stage and film director Stephen Daldry (“Billy Elliot”) has faithfully, expertly remounted the highly successful revival that he first staged in London in 1992, and that went on to award-winning runs in the West End and Broadway." "..."An Inspector Calls" remained a popular play to produce over the decades - even before the eye-popping current production - because each cast member gets a chance to show their stuff under the individual questioning." "...The play runs one hour and 45 minutes, with no intermission, and it's riveting right up to the climactic coup de théâtre and beyond." 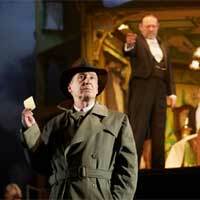 "...J.B. Priestley’s An Inspector Calls, as directed by Stephen Daldry, represents the best of international theatre. The play combines the chocolate-box delights of an Agatha Christie mystery with deeper undertones of morality and a tinge of the supernatural. Daldry’s justly famous version—first produced in the 1990s—is expressionistic in style, and equally relevant 25 years later." "...I vigorously encourage readers not to miss this production. Shakespeare Theatre Company, like the Kennedy Center, has been invaluable in bringing international theatre into town. Too frequently, the runs have been frustratingly short. What a treat for us that An Inspector Calls will be with us through December 23rd."